This Marcy ME 709 recumbent bike is designed for riders of all fitness levels and can help you to lose weight, tone muscle and burn a ton of calories per session. 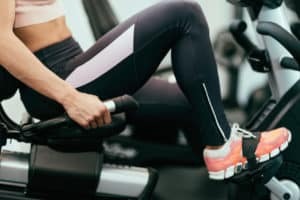 A recumbent bike will allow you to burn as many calories as a traditional exercise bike, however, it won’t put as much stress on your joints, which means a reduced risk for injury and less muscle fatigue and strain. As you work out, the legs are extended and the pedals are situated slightly below the bike’s seat. On a traditional bike, the legs are placed beneath the body as the cyclist leans over the handlebars, putting undue stress on back, knees, shoulders, arms, and ankles. The ME 709 is one of the more affordable recumbent bikes on the market, but the price actually doesn’t take away from the quality or effectiveness of this model. Weighing in at just sixty-six pounds, this is a lightweight bike that can handle a maximum weight of up to three hundred pounds, which is fairly typical of most recumbent bikes. Equipped with eight levels of resistance, this bike is a great choice for beginners because it gradually allows the user to increase endurance safely. It also features an oversized console for easy monitoring. The rider will be able to keep a close eye on their progress by viewing the distance covered, speed and time. 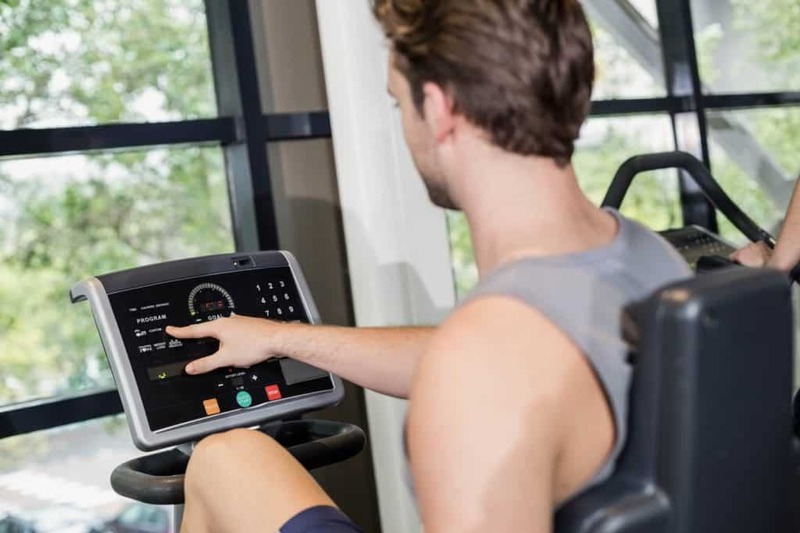 Calories burned per workout will keep you informed of your progress and allow you to safely increase your distance per session. The adjustable seat can accommodate riders of five to six feet in height to ride in comfort. The adjustable handlebars and pedals only add to the comfort of the ride and will encourage the cyclist to work out more frequently and consistently. The pedals are counterbalanced, enabling the user to ride forward or in reverse. The ME 709 comes with a two-year product warranty on the frame. The frame is small, sturdy and compact, making it the perfect choice for consumers who are short on space. It’s also very quiet running, so you can enjoy listening to your favorite music or workout while watching TV. According to consumers, the assembly will take about one hour to complete and is fairly easy to do thanks to the detailed step by step instructions. All tools needed for assembly are included in the package. The ME 709 isn’t a model that’s equipped with all of the bells and whistles, but it does offer a great riding experience and includes all of the features you truly need during your journey to get fit. 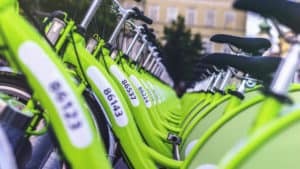 The style of the bike allows the rider to exercise and move with less stress to the knees, ankles, and back, which is why it’s suitable for any user with disabilities or arthritis. Because of the two stabilizer wheels located under the front stabilizer tube this machine can easily be transported. The bike’s step through design makes it easy to mount and dismount, without the need to lift your leg over the bar in the middle. A traditional bike requires the user to climb up in order to ride, which can be uncomfortable and almost impossible for riders with arthritis or other disabilities. The bike’s magnetic resistance system makes it virtually quiet running. Considered an entry-level model, the large, easy to read LCD screen and solid frame make it well worth the price. Unfortunately, this bike doesn’t come with a heart rate monitor, which is a downside for some consumers. Easy to adjust resistance levels require just a simple turn of the knob which is located in front of the seat. The pedals utilize counterbalanced technology, which helps them to move both smoothly and freely, front and back. The straps on the pedals are also adjustable, accommodating users of all sizes. The straps help to keep the feet securely on the pedal, preventing them from slipping during a high impact workout. This is a comfortable, easy to use recumbent that’s very basic and doesn’t come with a ton of features. The settings allow you to clearly and easily monitor your progress while tracking your distance and the calories burned. An affordable option, the lack of features are not a major issue if your primary goal is to get fit while not going over budget. Pros: This is one of the more affordable recumbent bikes on the market. All in all, the bike’s frame is well-built, the seat is comfortable and adjustable allowing for a more effective workout. Monitoring your progress is very easy and helps to push you, keeping you motivated during a harder workout. Cons: Some consumers had complaints in regards to the effectiveness of the different resistance levels. To increase the intensity of your ride you need to pedal faster. The faster you pedal the more resistance you get. The system utilizes a magnetic force in order to create tension. These resistance settings do work, but may not be very challenging for advanced riders. Some users noted that the resistance levels just weren’t tough enough, however, they work well for riders at the beginner or intermediate levels. If you’re an avid cyclist, then you may need a bike that offers a bigger variety of tougher resistance levels. The location of the resistance knob is convenient, allowing you to quickly change the resistance without skipping a beat. Consumers gave this model by Marcy a rating of four out of five stars for quality construction, easy assembly, pricing, and progress monitoring features. While the 709 may not meet the needs of the professional cyclist, it’s perfect for beginners, cyclists with disabilities and the elderly.